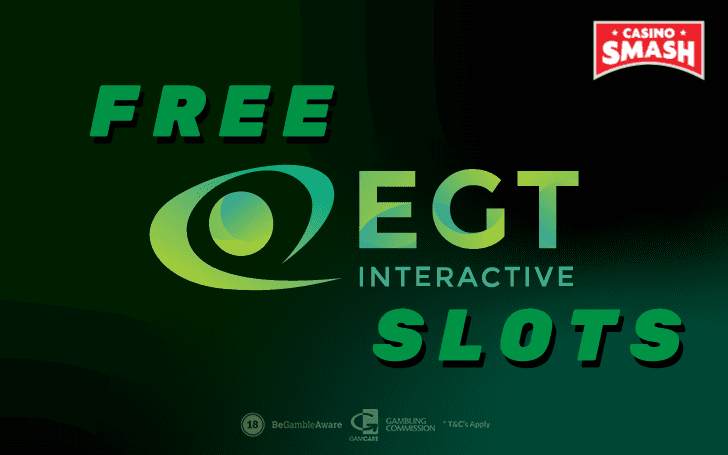 Play the best free EGT Slots and win a jackpot (or four) this year! is a gaming developer operating for almost 20 years now. They started with land-based Casinos and brought all the best practises to the online gaming world. Up to date, EGT is one of the most authentic and innovative Casino software providers out there. And all that while staying true to themselves and their style. When you see a free EGT Slot machine, not only will you want to play it, you can also easily recognize the developer. EGT implements various Slot games features and themes, yet you can see their style and values - high-quality, high return to player, and brilliant gambling experience for the player - in every single game they create. mobile Slots - you can play their games on any device you like. And you can see that as soon as you start playing. So, without the further ado, let’s explore the best free EGT Slots games that you can play this year. Witches Charm Fantasy Play here! Brave Cat Fairytale Play here! Dragon Reels Oriental Play here! Secrets of Alchemy Gold Play here! 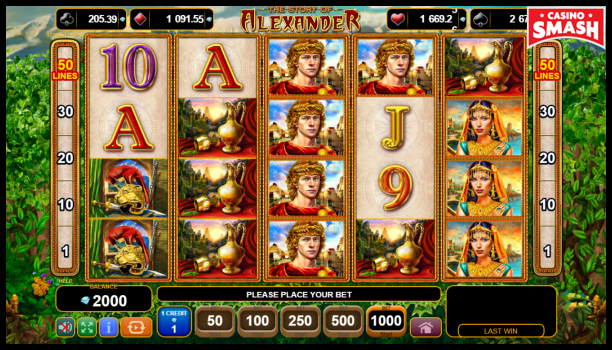 The Story of Alexander History Play here! Forest Tale Fairytale Play here! 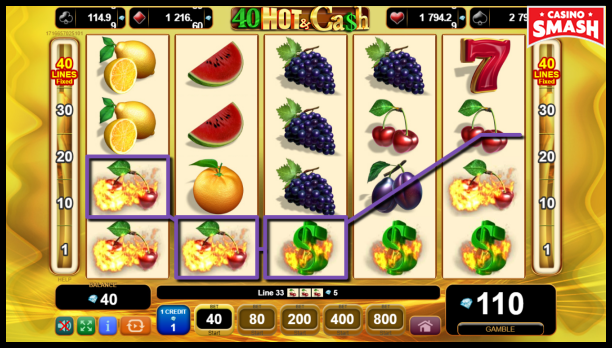 40 Hot & Cash Fruits Play here! Imperial Wars History Play here! Oil Company II Middle East Play here! 100 Cats Animals Play here! Route of Mexico Mexico Play here! Rich World Money Play here! Game of Luck Leprechauns Play here! Genius of Leonardo Art Play here! Like a Diamond Diamonds Play here! Great Adventure Ancient Egypt Play here! Circus Brilliant Circus Play here! Rise of Ra Ancient Egypt Play here! Dark Queen Fairytale Play here! 100 Burning Hot Fruits Play here! Retro Style Cars Play here! Action Money Action Play here! P.S. You’ll find all these free Slots at PlayAmo online Casino. They are available for both desktop and mobile gaming. EGT Slots, though, having similar rules, features, and structure as most of the Slot games, differ in some ways. Spin button. There is no Spin button when it comes to EGT Slots. Instead of a Spin button, you have buttons with different wager amounts written on them. Choose what you want to be and press the equivalent wager button to spin the reels. Diamonds vs Coins. 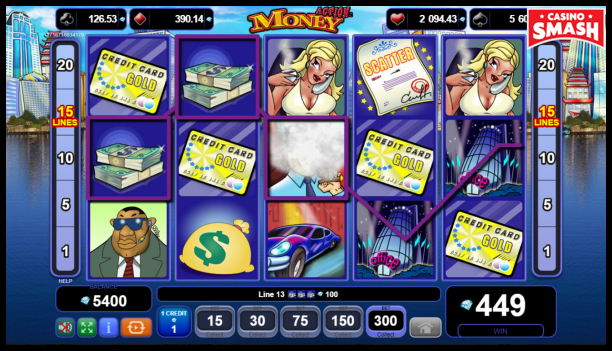 While Slot games usually don’t use real money and currencies, they convert it to in-game coins. EGT games, on the other hand, don’t have in-game currency coins. It has a form of diamonds instead. Four progressive jackpots. There are four jackpots attached to all EGT Slots. They are named after the playing card suits - clubs, diamonds, hearts, and spades - and differ in size according to that order. Clubs jackpot is usually a couple of hundreds of euros, diamonds at €500 or more, hearts around €1000-1500, and spades up to €2,000 and more. Did you know? The largest recorded jackpot win at EGT Slots was €3,852,020. You can win any of these progressive jackpots while playing any of EGT Slots. You can trigger a Jackpot Cards Mystery Bonus randomly, after any win. During the bonus round, you have 12 playing cards present, all facing down. Then you pick cards until you have three of the same suit. Which suit it is - that jackpot you win. Gamble feature. EGT Slot games also have a Gamble feature. After a win of a certain amount, you can gamble with it: try to guess correctly what color card suit will come up next. If you guess right, your last win is doubled. If you don’t, it is lost. 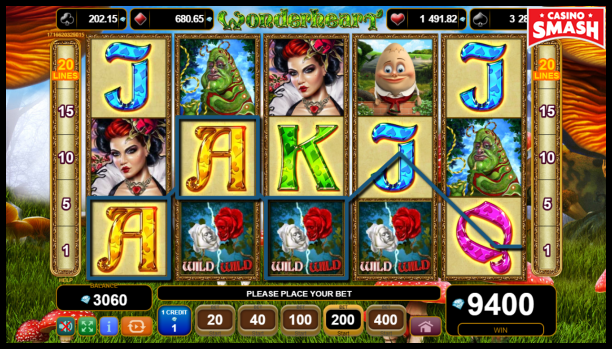 Wonderheart is a five-reel 20-payline Slot machine based on the story of Alice in the Wonderland. 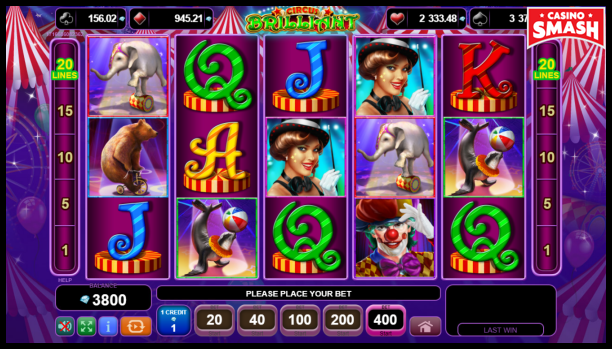 Slot symbols include the characters from the story, including Alice, the Queen of Hearts, hookah-smoking Caterpillar, Humpty Dumpty, and of course, the White Rabbit. Castle-like symbol works as a scatter. It appears on the middle reels and three of them or more triggers seven free spins. Alice symbol is a wild and Roses symbol are the double wild symbol (counts as two wilds). 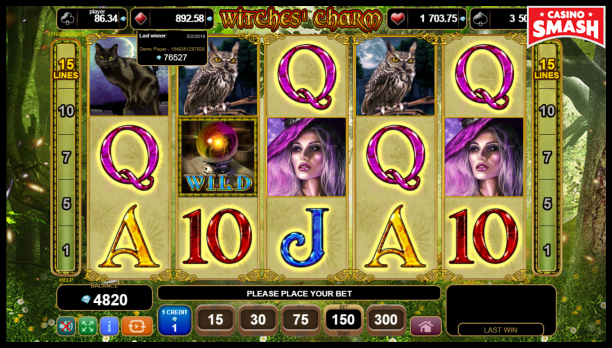 Witches’ Charm is another fantasy-themed Slot by EGT, presenting two beautiful witches and stereotypical symbols related to the witchcraft. The Slot has five reels and 15 paylines. A Crystal ball is a wild symbol. It pays really well when you land five of them - up to 200,000 diamonds. Also, it doubles the win when substituting other symbols on the payline. If you land three or more scatters, which is a House symbol, you trigger 15 free spins with three times multiplier. 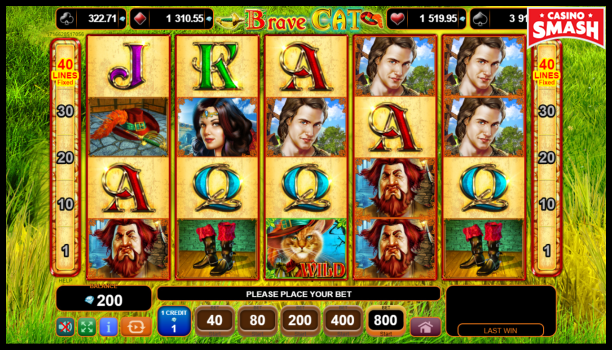 Brave Cat is a five-reel four-row 40-payline EGT Slot about the legendary Puss in Boots. The Brave Cat is the most paying wild symbol while two symbols work as a scatter: the Kingdom (castle) and the King. When you land five or more Kingdom scatters, you can trigger from six to 100 free spins with respin feature. When it’s five or more of King scatters - six to 100 free spins and Wild Credits feature (more symbols become wild). If you land four Kingdom and four King symbols, you activate six free spins, Respin feature, and Wild Credits feature. 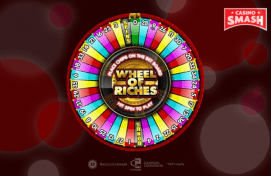 If you land five of each, you get 20 free spins and activate other features as well. 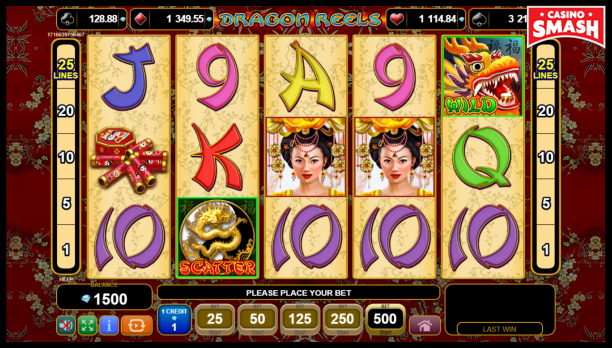 Dragon Reels is Asian culture-inspired five-reel 25-payline video Slot by EGT. It burst with red and gold colors and Oriental symbols. Dragons symbol works as a scatter and a wild. Dragon wild is the most paying symbol, substituting all the other except the scatter. Scatter is the Golden Dragon that brings not only luck but also 10 free spins with 2x multiplier if you land at least three of them on the reels. 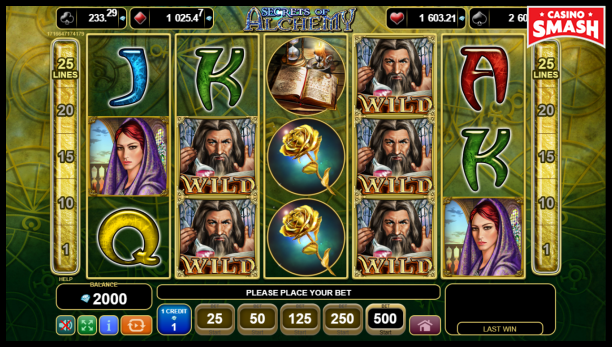 Turn your spins to gold with Secrets of Alchemy Slot machine. Kingdom (Castle) symbol works as a scatter and appears on the first three reels. When you land three of them, you can expect seven free spins coming your way. Alchemist symbol is the wild that can appear on all reels but the first one. It often falls on the reels in stacks. If you’re a history fan, The Story of Alexander Slot may be a treat for you. It has five reels and four rows, 50 fixed paylines, as well as symbols that any Ancient Greek fan will recognize. A Horse is a wild symbol that appears on all reels but first. A Tower is the scatter that spins in the first, third, and fifth reels. If you land three scatters or more, 10 free spins and Wild feature awaits. Here comes the Red Riding Hood-inspired Slot. 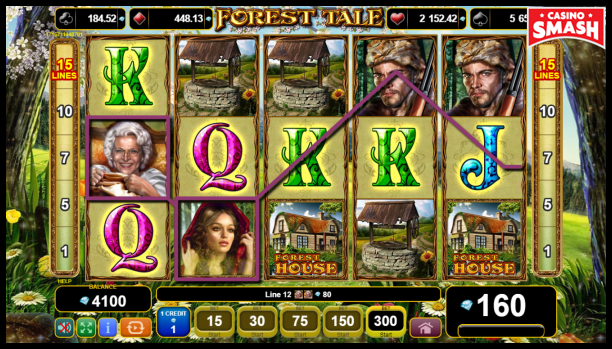 Five reels, 15 paylines filled with characters and symbols from the classic fairytale. Red Riding Hood is the wild symbol that not only substitutes all other symbols except scatters but also doubles the win if lands on the payline. The Basket of Wine and other goodies are the first scatter symbol that pays really well (up to 60,000 diamonds) and activates Forest House feature. It’s a pick-an-object game that rewards you with free spins and multiplier up to five times. The second scatter symbol has a form of the Forest House. If you land three of them and more, you get up to 20 free spins with up to five times multiplier. What happens when retro fruit Slots meet modern times? Slots like 40 Hot & Cash happens. You get your classic symbols - cherries, lemons, watermelons, 7s - you name it. But instead of 3x3 structure or five paylines, you get 5x4 structure with 40 lines! A Dollar sign is a wild symbol that substitutes all the others (except the scatter - Star symbol). It also expands to its neighbouring positions to help you trigger more paylines. Another trip back to historic times. 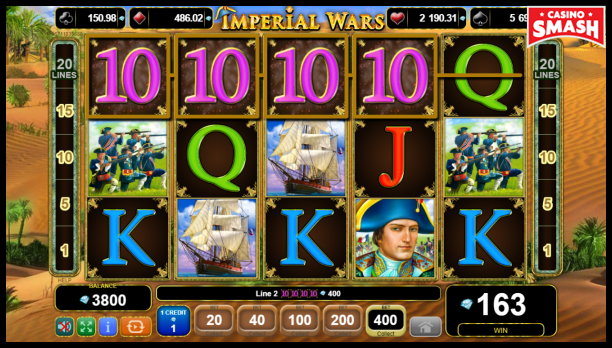 Admire historic clothing, ships, and fights in this five-reel 20-payline EGT Slot game. The Golden Gate symbol works as wild, old-fashioned cannon symbol is a scatter. Landing two or three of them triggers three or five free spins. During the feature, scatter symbols transform into Extra Spin symbol that can award you with extra free spins. And you also get locked wild symbols for additional wins. Get a crash course on where the oil comes from, whom it benefits, and where it’s used in the Oil Company II Slot. An Oil Well symbol lands in stacked wilds and substitutes other symbols. A Petrol Stock Exchange symbol is the scatter that appears in the middle (no, not East) reels. Landing three of them won’t take you to the birthplace of oil but it will award you with seven free spins. Shoutout to all the feline fans everywhere. 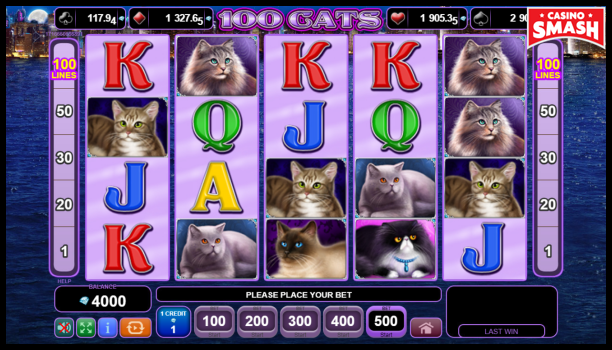 100 Cats Slot by EGT doesn’t feature 100 cats but 100 paylines instead. And that’s a lot for an otherwise simple-looking Slot with many cat pictures. Apart from the cat pics, these five reels also spin a Woman symbol as a wild that comes in stacks. And Cats Family symbol is a scatter. Land three of the latter one and you’ll get 10 free spins. It’s time to take the lucrative Route to Mexico and explore the wild nature and much more. 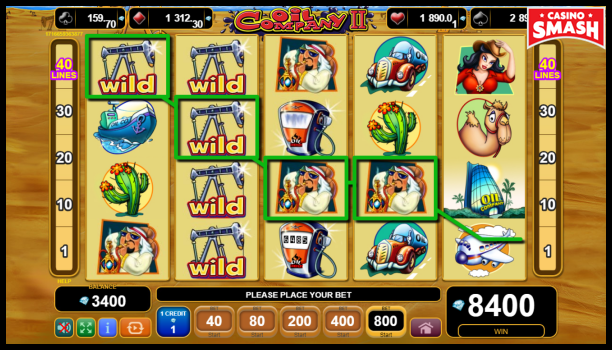 This Slot has five reels and 20 paylines, wilds, and scatter symbols. Scatter being the Red Car you take for the road trip. If you land three scatters (only appears in the middle reels), you get three free spins with guaranteed stacked wilds! 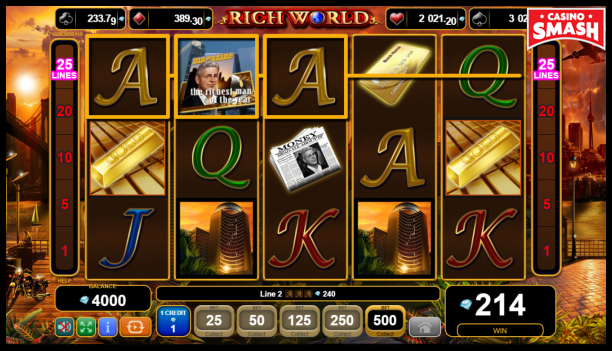 Rich World Slot presents you a rich lifestyle. Platinum Credit Cards and Safes with more gold than you can imagine. The Slot has five reels and 25 paylines but those are not fixed. You can choose 20, 10, five, or only one payline to be active during the game. Bank symbol is a scatter that can activate 15, 20, or 25 free spins if you land three of them and more. Find (or land) a four-leaf clover to bring you luck in the Game of Luck Slot. This Leprechaun-themed Slot game has five reels and 20 fixed paylines. It features symbols that bring luck, including wilds and scatters that are lucky in any Slot, really. The second and fourth reels feature a four-leaf Clover symbol. It stretches to the neighbouring positions on the reels and becomes a wild. 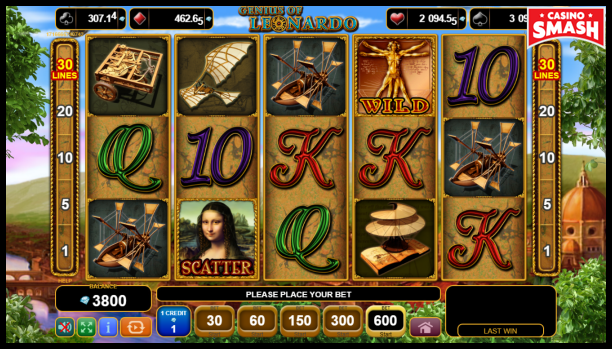 Genius of Leonardo is a five-reel 30-payline EGT Slot dedicated to the Leonardo da Vinci. Of course, it features the Mona Lisa. The painting also works as a scatter that can appear on the middle reels and trigger from five to 50 free spins. But it also features other Leonardo’s inventions as symbols. The guy was a man of many talents, after all. So, we had fruits, we had gold, now it’s time for another favorite symbol of the Slot machines - diamonds. 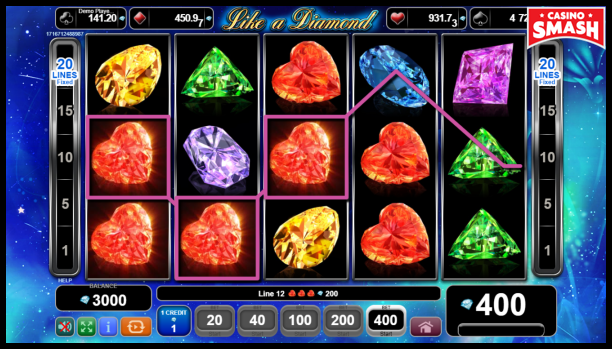 Like a Diamond Slot features nothing else, only diamonds. And diamond-filled wild and scatter symbols. 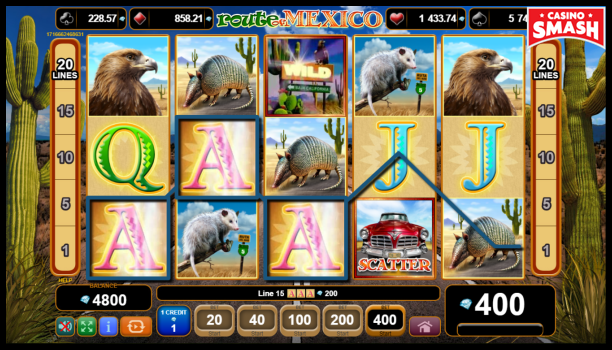 Wild symbol is the shiny logo of this Slot game. It expands to the neighboring positions and substitutes all the other symbols except for the scatter. Bats, spiders, black cats, pumpkins, and treats. Yes, it’s Halloween Slot by EGT. Dress up and go trick or treating. Or just spin the reels of this Halloweenish Slot machine. The Slot has regular symbols, wilds, extra wilds, and a scatters. The symbol of Witch’s Hat and Broom is a wild. Extra wild is Pumpkin that appears only on the fifth reel. It converts all A, K, Q, and J symbols into wilds. 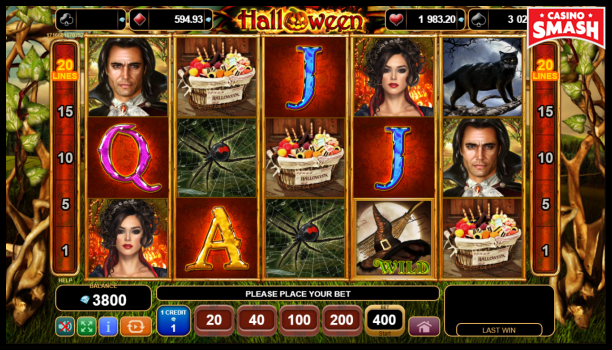 Book of Halloween is the scatter that can trigger 10 free spins with 2x multiplier. 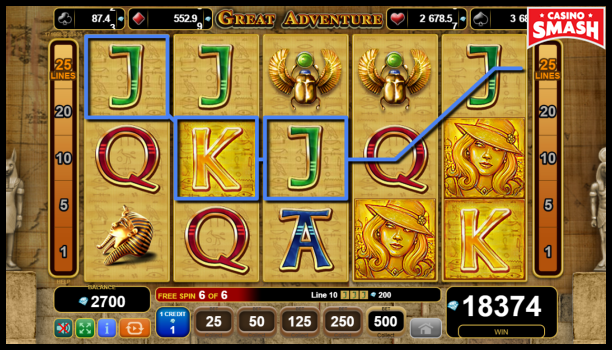 Great Adventure is an Ancient Egypt-themed Slot with five reels and 25 paylines. It takes you onto Indiana Jones-kind adventure to explore Egyptian artefacts and mysteries. Along the way, land some symbols of Journal and you’ll trigger Statue feature. It unlocks a pick-an-object game and you get to choose one of the five statutes. They hide three to 10 free spins inside. Also, as an extra gift - some of the regular symbols will turn gold and wild during the feature. The feature can be retriggered. Welcome to Casino Online the circus! Spin the reels and enjoy the show of five reels and 20 paylines bringing you wins and free spins. if it is an animal-performer - 15 free spins. Get extra five spins also if you land a letter symbol five times. More ? You got it! 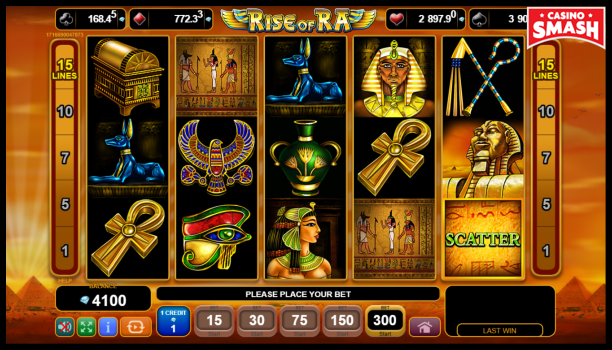 Rise of Ra is one of the most popular Slot games by EGT. It has five reels, 15 paylines, and a lot of gold-sparkling authentic Egyptian symbols. A Golden Scarab is a wild symbol and doubles the wins when appearing on a payline to substitute other symbols. A piece of Wall with hieroglyphs is a scatter. Land three scatters to activate 15 free spins with 3x multiplier. 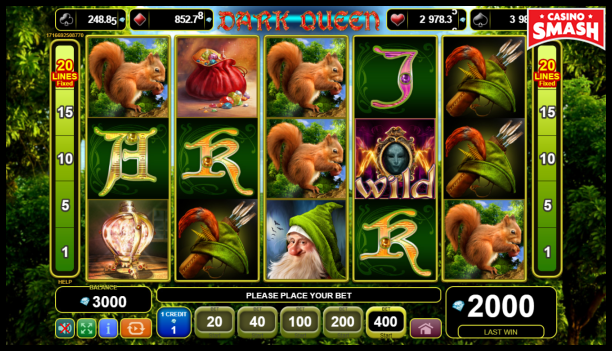 Dark Queen is another fairytale-themed Slot based on the Snow White. It has five reels and 20 fixed paylines. A Magic Mirror is a wild and a Poisoned apple is an extra wild. It appears only the first reel and converts all letters symbols on the screen into wilds. Sadly, this Slot doesn’t have a free spins feature. 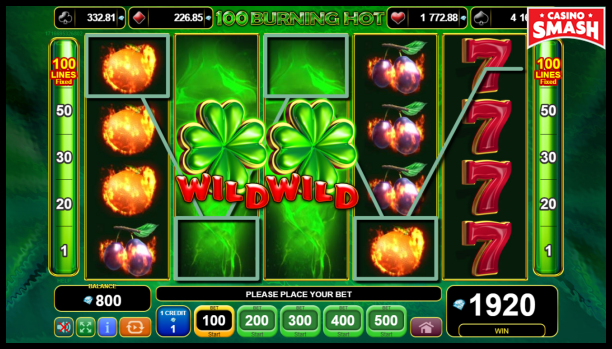 100 Burning Hot is yet another classic-themed free EGT Slot game. It features the classic symbols - berries, fruits, dollar sign, bells, and 7s. But the structure is not-so-classic: five reels and four rows. Not to mention 100 paylines. The Slot is simple but still has wild symbols and scatters. Two scatters, to be exact: a dollar sign and a star. They’re the most paying symbols in the game. 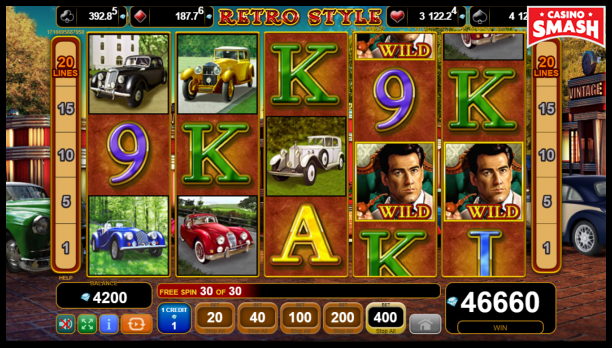 If you like retro things, and I’m not talking only Slots here, try playing Retro Style game by EGT. It’s a Slot celebrating all things retro. Man, presumingly, the owner of all these cars, is a wild symbol in the game. Everytime it substitutes other symbol in the payline, your win is doubled. Retro Wheel is a scatter. If you land three or more of them, you trigger 15, 20, or 25 free spins with a 3x multiplier. Let’s finish with a free EGT Slot that can replace an evening watching thrillers. Action Money Slot symbols will probably remind you of some crime or robbery movie you’ve watched recently. But this Slot will appeal to you even if thriller is not your genre of choice. Land three or more scatters to trigger the Bank feature. It’s a pick-an-object type of game. First, you need to choose one of the five banks presented. It will determine the multiplier you get (1x to 5x). Then, you’ll see eight envelopes on the banker’s desk. Each of them hides a number of free spins (from five to 12) and symbol that will be wild during the round. No matter what you choose, winnings are guaranteed.